Best Cryptocurrency Market Platforms and Services: Is Cryptonator a Scam? Warning: A week after writing this review we started to receive complains and after doing some more research we have found that this crypto wallet is probably a scam, over %90 of opinions, comments and reviews of cryptonator by clients tell about missing funds, stolen coins and a horrible over-all experience with the cryptonator.com customer service. Cryptocurrencies, a subset of digital, alternative and virtual currencies are digital assets which use encryption techniques to regulate currency units’ generation, verification of fund transfer, while operating independently. As such, cryptocurrencies are generally non-susceptible to government interference or manipulation since it is not issued by any central authority. Also, because it uses cryptography for security purposes, cryptocurrencies are generally difficult to counterfeit making the very secure. The Cryptonator is a highly secured online cryptocurrency banking platform. It is an online wallet for cryptocurrencies which allows users to perform cryptocurrency transactions in a fast, reliable and secured manner. It is especially renowned for the fact that it gives users the ability to perform transactions in different currencies as it supports up to 15 different currencies meaning users can use cryptocurrencies such as Bitcoin, Dogecoin, Dash, Zcash and Litecoin amongst others. It allows users to perform direct transactions in a fast and stress-free manner and also allows for instant exchange between cryptocurrencies using a single account. It should be noted that the Cryptonator offers users free multi-currency accounts easily accessible 24 hours a day on any device connected to the internet. The Cryptonator also acts as a calculator for cryptocurrencies. It allows users to calculate the price of any cryptocurrency in terms of another cryptocurrency, on in other physical currencies such as the Dollar, Euro, Pound sterling and others. Users can instantaneously and automatically exchange Bitcoin with other supported cryptocurrencies free of charge and at very attractive rates. 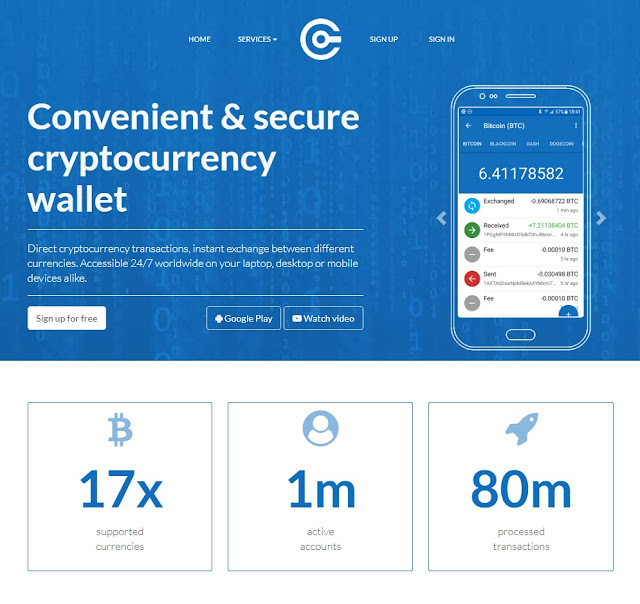 With over 300,000 active accounts, its ability to support up to 15 currencies and more than 6 million processed transactions, the Cryptonator might be the most attractive online cryptocurrency wallet. Also, another major advantage of the Cryptonator lies in its security component. Users are anonymous and it uses a two-step verification process, encrypted SSL connection, and trusted internet protocols with next generation account protection. Amongst the many cryptocurrency conversion tools available, the Cryptonator was the first integrate directly with the Chrome browser. The cryptocurrency platform can be accessed online or as a free Chrome extension. Transaction charges using the Cryptonator are very cheap and almost free. Users who wish to send Bitcoins for example using the Cryptonator Bitcoin App are charged a fee of 0.0001 BTC while transactions under set minimums are not credited to users’ accounts as these transactions are not processed using the accounting system. Also, using their private accounts, users can exchange cryptocurrencies at very attractive rates in a few seconds within seconds and without fees. Also, because of its device-friendly nature, the Cryptonator can be accessed 24 hours a day. 7 days a week using any device such as a laptop, desktop or mobile device allowing users to transact cryptocurrencies easily, conveniently and reliably. - It gives cryptocurrency users a platform through which they can perform cryptocurrency transactions easily and reliably. - Easily accessible every hour of every day because of its device-friendly and user-friendly nature. - It supports around 15 different cryptocurrencies providing users with a safe and reliable way of sending, receiving and exchanging cryptocurrencies online using a single account. - It also supports the automatic conversion of cryptocurrencies into over 300 currencies including fiat currencies such as the Dollar, Euro and Pound amongst others at real time and attractive rates with low fees or commission. With the rapid evolution of digital currencies, the Cryptonator provides a convenient, easily accessible, reliable and secure platform for cryptocurrency users to perform their transactions with complete anonymity and privacy as the Cryptonator is a lot more than just an online wallet. It is a means through which users can see the real worth of their coins.